The Ruby Ruth Doll’s team likes to think that Malcolm, Rita, Jasper and co put smiles on their owner’s faces after a long tedious day at work or school. 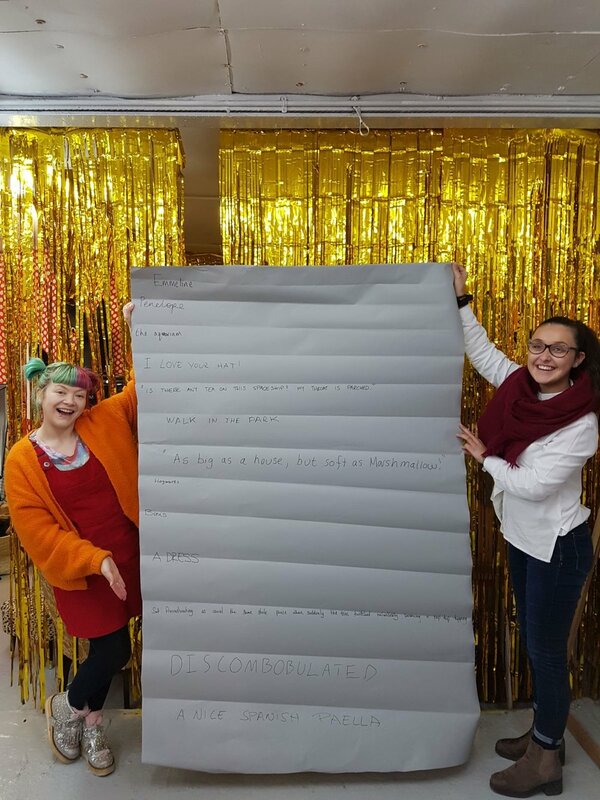 That is why we love hosting Our Open Days: they give us an invaluable opportunity to meet and interact with the custumers, the people who are our entire reason d’être. We also love to mark special occasions and this time we had loads to celebrate! First, we had the arrival of the newest member of Ruby Ruth’s squad: Easter Bunny’s best friend himself, Rhubarb. Did you know he’s a vegetarian who runs a dating agency and loves sci-fi movies? Click over and find out what a day in his life is like. We also had a big surprise for the attendees!......The unveiling of a brand new hand-made silk print starring Ruby Ruth characters! “Until Next Time (Ingrid waving off Ruby on her interstellar adventure)” is our first limited-edition hand- pulled silk screen print, featuring intrepid explorer Ingrid waving to her spaceship-dwelling friend Ruby as she zooms past the Jasper constellation on her way to the moon. Each print is numbered and signed by Jenny Mustill, who is not only the mastermind behind Ruby Ruth Dolls, but also the artist behind the print! The people who came to our open day had the opportunity to own this amazing artwork before it even hit the shelves in our shop. 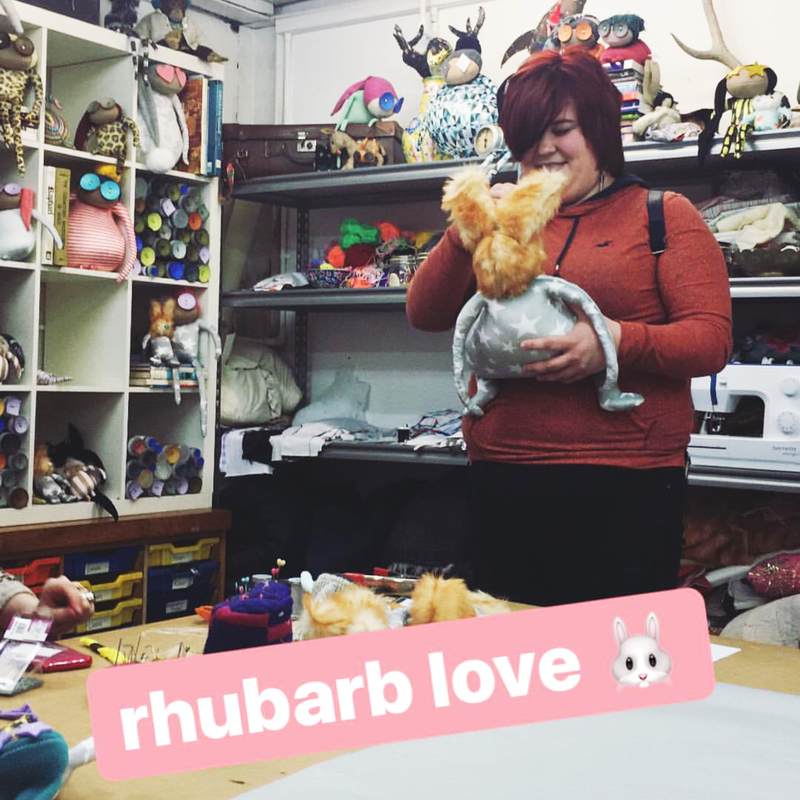 And last but not least, we wanted a special way to say goodbye to our friend Louisa, who has spent three years here at Ruby Ruth Dolls but is now starting a new chapter in her life. In our hearts Louisa will always be a part of the Ruby Ruth family! replied: "As big as a house, but soft as marshmallow!". They then went to Hogwarts and met Boris, who was wearing a dress and was sitting procrastinating as usual on the same stale pause when suddenly the toes twitched a tap tap tapping. The other two decided to join in, but they soon felt discombobulated. They all decided to call it a day and get a nice Spanish paella for dinner. Our awesome creative guests were also invited to share with us their ideas for a brand new Ruby Ruth character. They filled our walls with awesome ideas in post-it format! It was such a joy to see our studio filled with interesting conversation and free-flowing laughter coming from every corner... and, of course, doing all that while eating delicious cake! We hope that our guests enjoyed their day out and come see us again on our next Open Day!